The successful outcome of any business testing is driven by the ability and availability of quality as-close-as-real “test data”. Test data assumes key importance to ensure all possible business flows are validated and verified. With inaccurate & inadequate data comes poor testing, results you can’t trust and a whole lot of wasted time, money and effort. Managing test data is highly challenging due to data sensitivity, complex infrastructure, heterogeneous data sources and of course, limited availability. Test Data Management (TDM), thus, is fundamental to the success of your data strategy & overall testing strategy. At Cigniti, we have implemented robust test data management practices for complex enterprise platforms. With over 200 experts in the Data Governance practice, Cigniti has supported organizations in the implementation of solutions for centralized data governance, automated data management, data analysis & identification and high availability of test data. 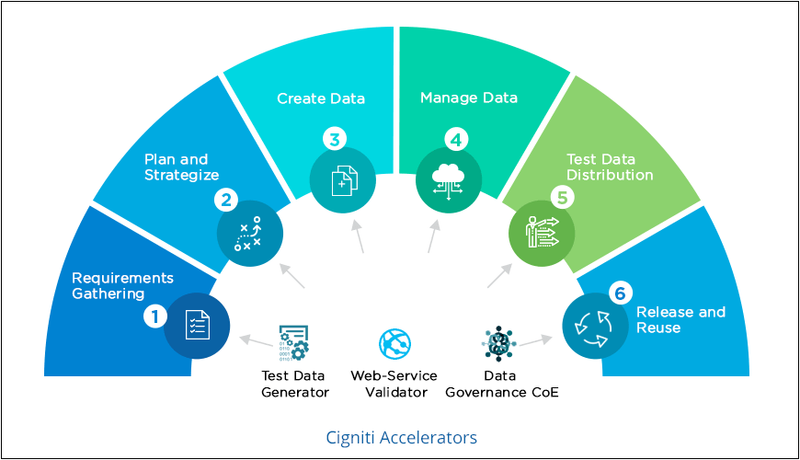 In addition, Cigniti has developed custom accelerators to aid in synthetic test data generation, test data optimization and Test harnesses for a wide variety of platforms. The Data Governance experts comprising of Certified DBA’s, SQL & Data Modeling bring in rich experience in tools such as IBM Optim, GridTools, DataMaker, QuerySurge etc. With Cigniti’s extensive expertise, you could Improve test effectiveness by using accurate test data, Institutionalize test data management process, Implement test data creation and simulation, Automate test data management & Protect data sensitivity. In-depth Identification of Requirements: Harness Cigniti’s deep industry knowledge in broad identification of test data requirements. These requirements can then be utilized to identify the source, volume, complexities, data subset policies, and data synthesis needs. Holistic TDM Processes: Publish clearly defined data management workflows, policies, and procedures for the creation, load, and protection of test data. Define metrics to measure data health in each environment and use reduced volumes of production data when a full load is not needed. Effective TDM Techniques: Use data subsets which contribute to effective testing as it enables usage of real-life data sets only on a smaller scale. Use data masking, NULL’ing out, substitution, or encryption techniques to maintain data security by protecting sensitive data. Tools & IP: Cigniti’s Test Data Generator tool to reduce the manual process of creating test data and minimize the chance of errors. Reuse subset criteria and masking policies on multiple and different sources. Identify the table relationships and the sensitive data. Dedicated TDM Team: Dedicated resources to manage and accommodate every project’s test data needs. Data Governance Centre of Excellence to support with the required tools, resources, and expertise. 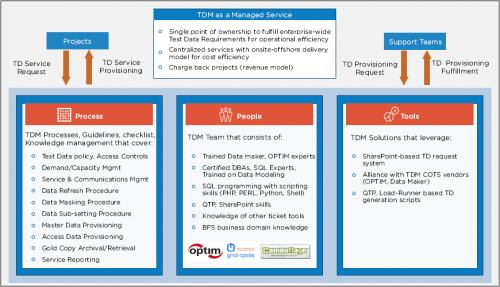 TDM makes available voluminous, on-demand, fit-for-purpose, real test data, that further helps in the coordination and management of test data. An intelligent data sub-setting system leads to an optimized infrastructure, storage costs, and TCO, and also in implementing an effective risk mitigation system. 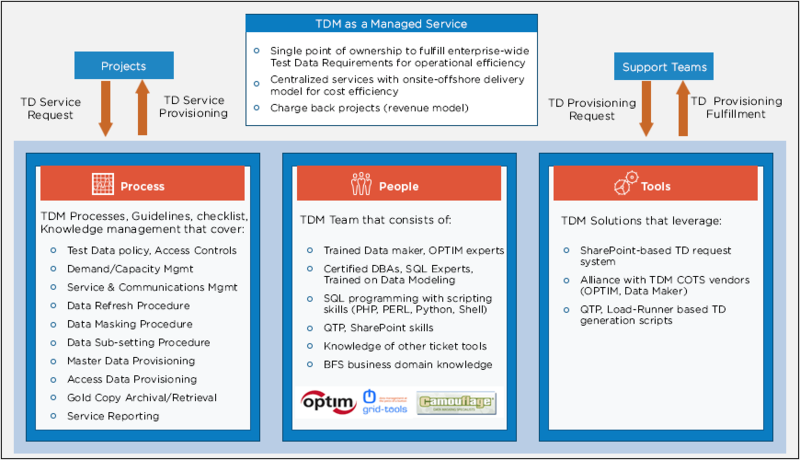 TDM also acts as a centralized tool for data request and distribution, that leads to quicker data provisioning. With an automated test data process, and cloned data subsets resulting in a quicker test data set up, the test cycle time is also reduced. Cigniti is a thought leader in the test data management domain and publishes regular Blogs and WhitePapers to share the latest trends and best practices. Cigniti has partnered with various Test Data Management tool vendors which helps our clients the option to choose the right tool based on their requirement and budget.